A close-up of the Expose-R facility that complements Expose-E aboard the International Space Station. Early Earth lacked an ozone layer to act as a shield against high-energy solar radiation, but microbes flourished by adapting to or finding other forms of protection from the higher ultraviolet radiation levels. Now researchers have begun testing modern microbes to see if they could act as pioneers in the harsh conditions of extraterrestrial space and other planetary environments. One such study from last year looked at Bacillus subtilis, a common soil bacterium which has become a model organism for experiments and holds the record for space survival after spending six years on NASA's Long Duration Exposure Facility spacecraft. Bacillus subtilis bacteria as seen in a scanning electron micrograph. The ordinary microbe proved capable of evolving a resistance to UV radiation of up to 3 times higher than that of the original ancestor or a non-UV-exposed group, after 700 generations lived and died in an Earth-based lab experiment. By comparing the radiation-resistant mutants with their ancestor and the non-UV-exposed group, researchers could almost be certain that their adaptation to UV did not come from a UV-resistant specimen hiding among the original bacteria population. That adaptation to radiation hints at how some microbes might have survived a journey to Earth aboard ancient asteroids, according to the theory known as Panspermia. Similarly, the adaptive ability indicates how Earth microbes might be able to colonize harsher extraterrestrial environments such as Mars, although even the most radiation-resistant bacteria would face other challenges if they tried to survive beyond Earth. The experiment also showed that B. subtilis was capable of adapting to UV levels even higher than those found on a primordial Earth – a harbinger of untapped potential that still lies within some organisms. Microbes can tolerate extreme UV conditions by making use of shielding materials, such as this salt crust in the Arabian desert. Survivability doesn't mean that the bacteria don't have limits. The researchers estimated that the bacteria undergoing "totally unshielded exposure" would only survive for two and a half minutes on the surface of early Earth. Luckily for B. subtilis, its soil home should provide some shielding protection under more "naturalistic circumstances" on Earth. The fact that the bacterium spends most of its life in a protective spore state also adds to its timeline for survival. At the same time, the researchers made sure that the apparent radiation resistance in their experiment did not come from any kind of shielding. They confirmed the lack of shielding by looking at the DNA photoproducts molecules that resulted from UV exposure in both the UV-evolved and ancestor cells to make sure they were the same. The bacterial cell ability to repair DNA damage may change in terms of speed, but the overall repair ability remains unaltered, according to Wassmann. He and his colleagues continue to analyze any changes in the repair pathways. "Whole genome sequencing of an UV-adapted strain yielded no alterations in genes coding for enzymes involved in UV-mediated damage repair," Wassmann explained. In Michael Crichton’s novel, “The Andromeda Strain,” a military satellite crashes to Earth and brings with it deadly extraterrestrial microorganisms. The mutant microbes have not remained idle since their adaptive changes. 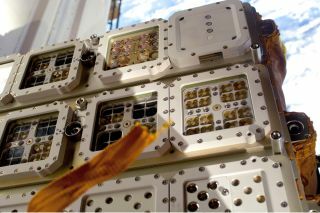 Researchers sent the hardy Earth bacteria up to the International Space Station for a real test of radiation resistance in the space experiment ADAPT, which was mounted on the EXPOSE-E platform of the space station's Columbus module. The samples returned to Earth at the end of September 2009. The dormant bacterial spores have been exposed to both space and simulated Martian conditions for 18 months. That meant they had to survive not only the increased radiation dosage, but also exposure to vacuum and the loss of water. "The hypothesis to be tested experimentally in ADAPT was whether longer-lasting selective pressure by UV radiation results in a higher UV resistance, as well as in a higher resistance against further ‘extreme’ environmental factors that exist in space," Wassmann said. The evaluation of the space experiment results has been ongoing since early 2010. But the Earth-based experiment that created the mutant microbes has already pointed to the greater considerations for both the past and future of humanity in space. "If this single organism is capable of founding a new and well-adapted population, it has much more potential for inhabiting new biotopes," Wassmann said. "And this has large impact on different fields including, but not limited to, the theory of Panspermia and planetary protection issues." Given the ability of even small invertebrates known as water bears to repair DNA after radiation exposure, more surprises could yet await researchers who study the bacteria. The study was detailed in the July/August 2010 issue of the journal Astrobiology. The researchers at the German Aerospace Center now have additional B. subtilis samples to examine from the EXPOSE-R platform that returned to Earth aboard the space shuttle Discovery on March 9, 2011.